Mnet Asian Music Awards is the biggest music awards show in Asia which is broadcast live across 13 countries. The event was launched in 1999 as a music video awards ceremony, modeled after the MTV Video Music Awards. Led entire stage design process from planning to execution. I designed the stages for 2013 MAMA and 2015 MAMA in Hong Kong. On this page, I would like to present my work from 2015 MAMA, the highest-rated stages that I am most proud of. The theme of the show was 'State of TechArt', a concept that combines cutting-edge technology and art. I will share some of my design process and challenges. Research & Interviews Have meetings with producers, performers, marketing, and brand design teams. Concept Visualization Research designs and suggest several ideas. Modeling & Drafting Design the stage through 2D & 3D modeling softwares. Finalize the design with stakeholders. Prototyping Make a small scale model and check possible obstacles and errors. Ordering Deliver final drafts to set factory and related technical teams. Delivering Share production schedule with stage teams and finalize communication about budget. Set up Build the stages according to the schedule and oversee the process. Rehearsal Proceed with run through the entire show and check the timing of interactive systems. Show day Communicate with engineering teams and gives cues for interactive systems. Dismantle Take down and pack up the stage systems and props. I was in charge of coordinating with 17 artists for this award show and they each had unique requirements for their stage performances. Not only that, at that time, our company wanted to rebrand by showing their new image on stage. Also, the audience wanted to be closer to the performers during the show. Taking all of those into account, our goal was to create a 3 dimensional curved form. Depending on the angle, the curved form gives unique experiences for both performers and the audience. Conventional stage mostly has flat surfaces and is not a unique experience. And this is our goal that consists of all curved lines. Artists benefit from this unique stage as well. I started to make a concept model. After stakeholders approved this concept model, I started to draw 3D models and drafts for production. This is a 3D model and I also converted the model into VR to check one to one scale. After that, before placing an order to the set factory, I needed to ensure everything was safe. We simulated load bearing points and optimized the design to reflect that. Here, we cut one set into two parts and changed the angle to ensure safety. The other goal was making a custom screen with LED. Since this set is a 3D curved model, we developed two types of LED screens. Left one was ideal - by plugging a bunch of lights into the customized surface. But because of the production schedule and budget issue, Right one - flex LED was easier to make. As you can see here, since the LED screen was a square type, it had gaps between screens. So, I communicated with the camera team closely and asked them not to show this part during the show. I was on-site for 5 months and coordinated with 500 engineers. The materials came from 4 different countries. So, we needed to think ahead about how to assemble everything without problem after making the structure. 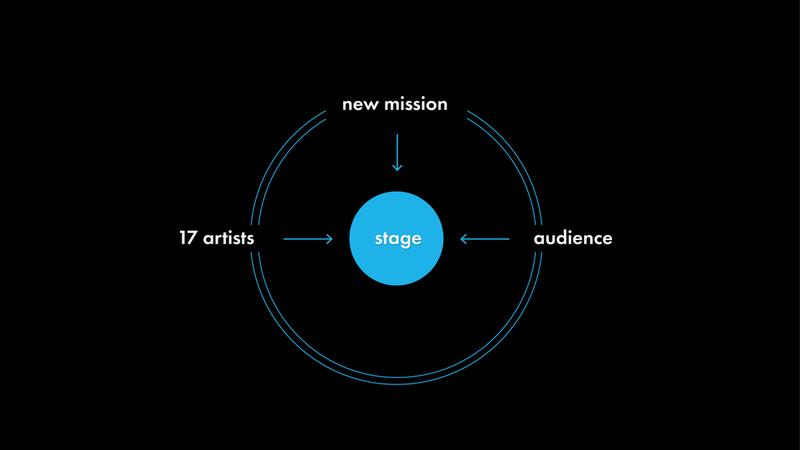 In order to give an immersive experience for both artists and audiences. I considered structure and movement of lighting that corresponds with the artist's performance. The lyrics of this song are narrative and emotional. Therefore, I wanted to deliver this story through color and material by using 4 facade hologram projecting technology. By using drones, I wanted to show how to use a space in a new way. My initial approach was to use groups of drones over the entire arena. However, this arena did not allow the use drones above the audience. So, I only used drones on the stage and installed transparent fishing lines so the drones would sense the barrier of the space. The most viewed scene of this show was the moment of announcing the awards. I wanted to make the space behind the hosts moveable and attractive. So, I used 2 robotic arms that responded to the hosts' movements. From my stage design experience, I learned that design lives in both physical and digital worlds and connecting them is something amazing. I learned how to work with experts from diverse backgrounds. While I was working with various artists, I realized that great design means users own their experience just like those artists own their stage. And lastly, I was lucky enough to have a chance to think about inclusiveness by designing a stage for Stevie Wonder. I think this is huge asset as a designer. My role as a stage designer was vital to the show. However, I would also like to give credit to other important members of the team. The full list of the credits is included at the end of the show. Please reach out to me to access patented projects (2D Draft & 3D modeling for production).